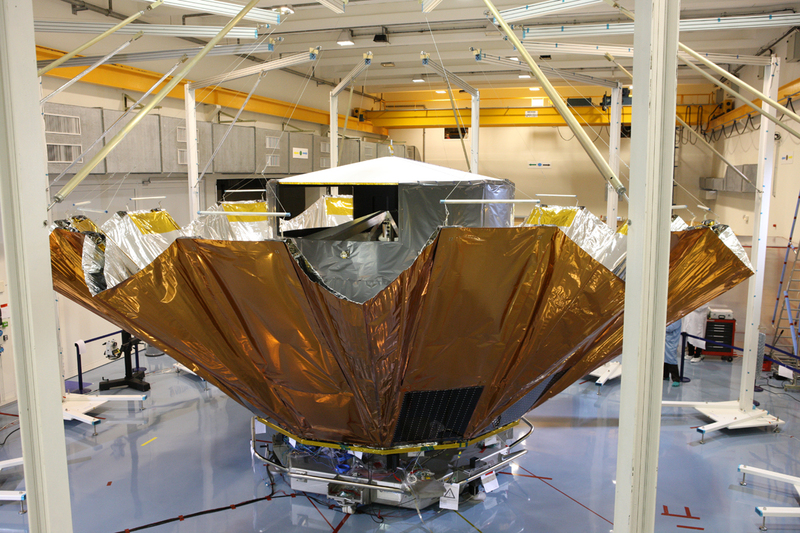 Gaia Deployable Sunshield Assembly (DSA) during deployment testing at Astrium Toulouse. Since the DSA will operate in microgravity, it is not designed to support its own weight in the one-g environment at Earth's surface. During deployment testing, the DSA panels are attached to a system of support cables and counterweights that bears their weight, preventing damage and providing a realistic test environment. The flight model thermal tent is visible inside the deploying sunshield and the mechanically representative dummy payload can be seen through the aperture in the tent.